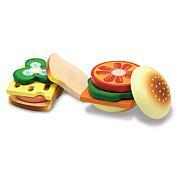 Here is a parcel of the food your little chef needs to keep chilled for delicious food play. 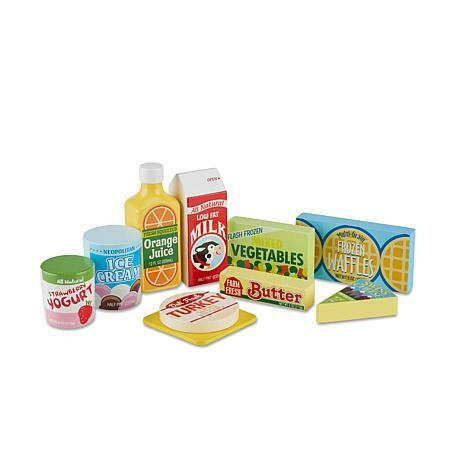 Nine wooden pieces include orange juice, waffles, milk, ice cream, cheese, yogurt, frozen vegetables and butter. 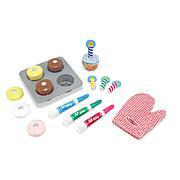 Extra learning fun is provided when deciding whether to put a particular item in the freezer or the fridge. 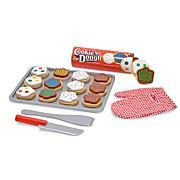 My grandchildren love everything Melissa and Doug. I was surprised by the solid wood construction of the pieces. The painting is accurate and makes the products seem real to the little ones. Wonderful set. It was hilarious watching our son set up and organize the fridge on his kitchen set. Too cute! 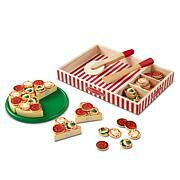 Very nice product and the items are designed nicely to be easily recognized by the children. he knew what everything was and where it should be kept.